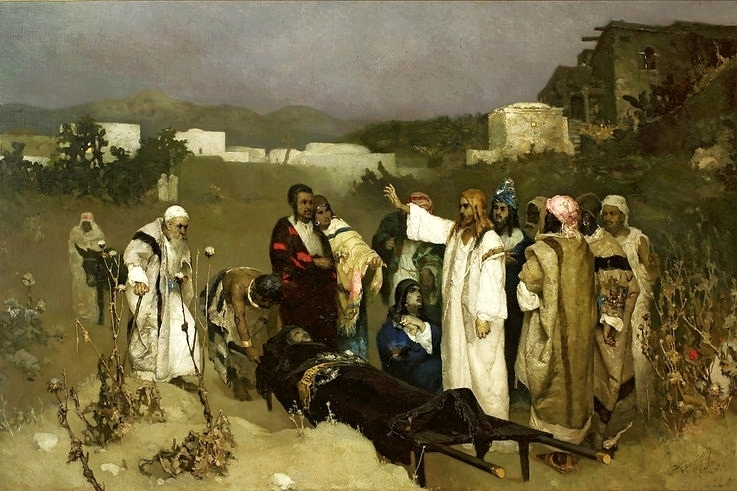 Jesus and the Widow of Nain by Wilhelm Kotarbiński – cyfrowe.mnw.art.pl, Public Domain, Wikimedia Commons. Think about someone who was there for you at a critical moment in your life, one of those times when you just didn’t know how or if you would get through it. Who was there for you? Picture his or her face. Say their name out loud. Who was it? What was happening in your life at that time? What was that critical moment about? What were you feeling? What did you need or want at that moment? What did that person do for or say to you? In what ways was he or she there for you? You’ve just told today’s gospel (Luke 7:11-17) through the story of your own life. Whatever your critical moment was, whoever that person was, and whatever that person did or said the result was that she or he helped you cross over into a new life, into a new way of being, into a new way of seeing. They called forth a part of you that you didn’t even know was there. They helped you see what you couldn’t see by yourself. They pointed you to a greater fullness of life. They got you though that time and they forever changed your life and who you are. Why else would you still remember today that event, that person, and what they did? That’s what Jesus did for the widow in today’s gospel. He was there for her at a critical moment in her life. They met at the town gate in Nain. Jesus was coming in and she was part of a funeral procession going out. When Jesus placed his hand on the funeral bier it was a moment of crossing over for the widow, the same kind of crossing over you just described. Now you might say that your story didn’t involve the death of a loved one or, if it did, you didn’t get him or her back like the widow did. No, you didn’t and I understand that. But I am asking you to not literalize the text. I am asking you to free the gospel from the facts of the story so that its beauty, power, and meaning can be experienced in the facts of your own stories, so that its truth can be as real for you as it was for the widow of Nain. Otherwise, this is just another feel good story for someone else but has nothing to say to us. Christ’s hand on the funeral bier is a metaphor for presence, the presence of God in and through a human life. That it is a metaphor doesn’t mean that it’s not real. Rather, it means that that presence is real in every time and place. The truth told in today’s gospel cannot be limited to the facts of its telling. Let me give you some examples. A week ago this past Thursday was one of those critical moments for Cyndy and me. It would have been Brandon’s thirty-fourth birthday. A few people knew that and knew that we would be visiting his grave. They offered prayers for us. One sent a card. Others sent text messages. What they probably didn’t know is that they were helping us cross over back into life. In some way that I can’t explain their remembering gave Brandon back to us. They were present to us and their card, messages, prayers, and love were the hand of Christ on the funeral bier of our lives. A couple of weeks ago someone in this parish who is going through a difficult and heartbreaking time told me that someone else, whom he doesn’t know all that well, came up to him, hugged him, and said, “I love you and I’m so glad you are here.” That was a moment of crossing over for him, crossing over into hope, strength, and a future. With that hug and those words the hand of Christ touched the funeral bier of his life. Several years ago I was walking through the Atlanta airport when a young couple stopped me. They were at most in their early twenties. The woman was crying. She said, “Father, we’ve just been married and I am so excited and so scared. We’re moving out of state and I’ve never lived away from home. I’ve never been outside of Georgia.” Then she took off her necklace, a crucifix her mother had given her, and she asked me to bless it. You know what that was about, right? It was a moment of crossing over. It was a critical moment in her life and she was looking for someone to help her across. The moments of crossing over are always before us. Sometimes they seem so ordinary and mundane that we miss them. Other times we are in awe of the moment and convinced that “God has looked favorably on us.” When someone tells you about his or her life and asks for help or advice, that is a moment of crossing over. When a teacher sees a student’s face light up with understanding it is a moment of crossing over. When your boss says, “Well done,” and you weren’t so sure of yourself, that is a moment of crossing over. When you and another reconcile and heal a relationship, that is a moment of crossing over. When you sit in silence at the deathbed of friend or family member, that is a moment of crossing over. When you speak a word of encouragement or hope to another, that is a moment of crossing over. When you see or experience something that makes you want to be a better human being, that is a moment of crossing over. Our lives are a series of crossing over. 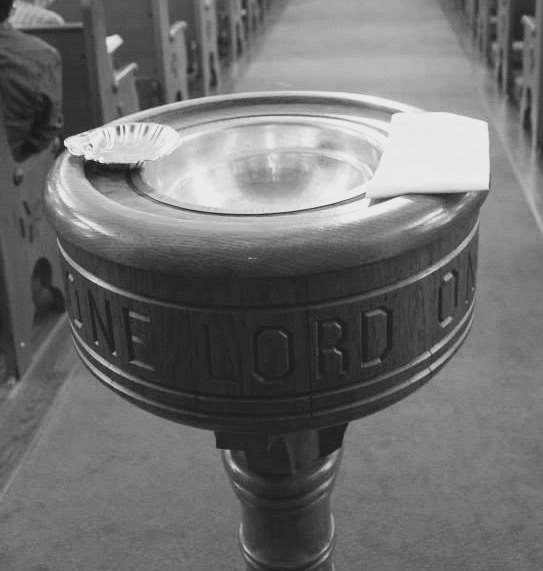 The sacraments, liturgies, and feasts of the church are about our crossing over. And we do that together. No one crosses over by himself or herself. Baptism, confirmation, eucharist, healing, confession, marriage, ordination – don’t you see the crossing over that is taking place? Each of those is moving us into a new life. Easter is the feast of the great crossing over. And yet there is also a crossing over that happens at Christmas, Epiphany, Ascension, and Pentecost. The saints themselves are examples of crossing over and they become our guides and teachers. Many of the stories we tell about Jesus are about crossing over. Last week it was the centurion and his sick slave crossing over. When Jesus told the “fish-less” disciples to put the net on the other side of the boat, it was a crossing over. The healing of blind Bartimaeus was a crossing over. Releasing the demoniac from the Legion of demons was a crossing over. Forgiving the woman caught in adultery was a crossing over. Jesus asking Peter three times, “Do you love me?” was a crossing over. And what about Jesus and his crossing over? Sometimes, because we call him the Son of God, we think he did it on his own and had no need of others. But let’s not forget Mary at the wedding in Cana saying, “They have no wine”; the Canaanite woman saying, “Yes, Lord, yet even the dogs eat the crumbs that fall from their master’s table”; the woman bathing Jesus’ feet with her tears and anointing them with oil; or the crowds that moved Jesus to compassion. All along the way there were people touching Jesus’ garments, tugging at his heart, and taking in his spirit. They were a part of his crossing over. I don’t want us to just talk about crossing over. I want us to enact it again and again. I want it to be real for us and for the world; today, tomorrow, and the next day. And if you are wondering why I am walking to the baptismal font and asking yourself, “What is he up to?” let me tell you. Your baptism was the beginning of your crossing over. It was not, however, for your life only but also for the life of the world. Crossing over is not a one time event. It is a way of life. It is the way of Christ and so it is also our way. When you leave here today and walk through the church doors you, like Jesus did, are stepping through the gate of Nain into a world in which people are hurting and in need, a world in which people are lonely, afraid, grieving, lost, and overwhelmed by life, a world in which some are sick and others are dying, a world in which people are looking for a new life, a more meaningful life, and trying to become the best person they can be. What the people of that world don’t know and what I want you to remember by the sprinkling of this holy water, is that through your baptism you now are Christ’s hands, feet, eyes, ears, mouth, and heart in the world. Do not underestimate what that means, in either its power or its responsibility. When, at your baptism, the priest chrismated you, anointed you with holy oil, you were “sealed by the Holy Spirit in Baptism and marked as Christ’s own for ever.” You were declared capable, equipped, and ready to be Christ to the world. The gate is open, there is work to be done, and you are the one. * I am indebted to and grateful for a dear friend and mentor who discussed with me today’s gospel and some sermon ideas. He is and has been for a long time part of my own crossing over. Thank you very much Narelle. It was helpful for me to study this sermon in the context of last weeks talk on “Bearing the Unbearable”. Fr. Marsh states that “if there is a mortal sin it is unconscious living”. These “Crossing Over” times and people “place us on the threshold of our lives”. This process forces us out of our unconscious living. These are times when I have found myself more in tune with the presence of my God. If I can grow and expand upon the people, places and events that do this when things are good, they hopefully I will be stronger when I need the strength. I found these two sermons to be very complementary and made a less well know gospel passage come alive with personal meaning. As always, I was quite drawn in by Fr. Marsh’s delivery style.